Hebrews 13:1-3 Let brotherly love continue. Do not forget to entertain strangers, for by so doing some have unwittingly entertained angels. Remember the prisoners as if chained with them—those who are mistreated—since you yourselves are in the body also. The passage above calls the body of Christ to continue in the love commanded by Jesus Christ Himself; the love that reveals that we are truly His disciples. The command itself is repeated frequently, because even in the early church self-interest, personal preference, or the potential of personal gain, threatened the pure godly love Christ commanded. Hebrews was written to encourage Jewish backed believers in Christ to not abandon fellowship with one another, to return to the obsolete O.T. system. In the first three verses the word of God reveals two ways of continuing in brotherly love. The first was to “not forget to entertain strangers, for by doing so some have unwittingly entertained strangers”. At first our thoughts are drawn back to the father of the faithful Abraham, in Genesis 18, where the LORD appeared to him in the form of three men, one obviously a theophany (visible manifestation of the glory of God, in this case in human form), the other two men are literal angels of God, who later rescue Lot from Sodom. We also remember the appearance of the Angel of the LORD to Joshua (Joshua 5:13-15), as well as His appearance to the father and mother of Samson (Judges 13). Both appearances are in the form of a man, yet though the title is the Angel of the Lord and the Captain of the Lord’s host, we understand these to be theophanies of the Anointed of the LORD (Psalm 2, Isaiah 11, Isaiah 61:1-3); the Christ before His first incarnation in the virgin’s womb. The point being, we are to remain hospitable, for visitors we meet the first time, may indeed be angels of God sent to give us a messenger, for that is what angels do. Yet the context broadens the command of “let brotherly love continue”, for angels are not our brothers. it is important to remember that the word “angel” in the Greek carries with it the idea of messenger, not just for the angels God created before the foundation of the earth, but also for human messengers of the Lord. This fits nicely with the narrative of letting brotherly love continue for traveling ministers of the Lord who would travel from place to place to preach the gospel and encourage the body of Christ. In fact, in reading II John you will find the apostle’s Holy Spirit inspired message to encourage the body to “entertain strangers” who may be messengers of Christ, while rebuking those who would not even receive the apostles as Christ’s messengers. The passage does not call us to choose supernatural “angel” or human, but allows for both, while emphasizing the human that we would extend brotherly love through hospitality. The second command also is an expression of the continuation of brotherly love. This instruction would have been very close to the original readers lives, as the very reason for some of them contemplating abandoning the fellowship of the saints (a very bad thing as detailed in Hebrews 10:19-31), was that many were unjustly placed in prison and were being physically mistreated, through persecution. The sufferings of our brethren are to galvanize our own faith, and add fuel to the Holy Spirit fire that is to be in the furnace of our heart for God. Yet this means we must know the sufferings of the brethren around the world and pray for them in their trials, allowing their testimony to deeply touch our hearts. This is difficult when we are narrowly focused on our own cell in the body of Christ. We must ask God for His sight and burden for His children. Below are the expedient needs and testimonies of two of God’s precious children, through Christ’s death and resurrection. Over 10 years ago this mother of five was working and took water to Muslim coworkers, whom did not want to drink out of the same cup as a Christian. only a couple days later, she was surrounded by an angry mob, bent on killing her. After being beaten they threw her in a locked shed, trumped up blasphemy charges and she has been in solitary confinement for the greater part of 9 years, waiting for them to carry out a death sentence by hanging. Although the Muslim governor of the province where this took place was assassinated for standing up for her, she largely remained unknown to the vast majority of American Christians. Yesterday marked the beginning of her last appeal. Although the judges have cited little if any evidence of her violating any minor crime, let alone a charge of blasphemy, they once more reserved judgment, knowing to over turn her sentence and release her would almost cause their own death and to put her to death would condemn the innocent. Our dear sister in Christ has stood firm in not denying Jesus, decided that to live is Christ and to die is gain, and has counted the sufferings of this present hour small in light of the glory to be revealed in her, when she is with Christ; Please pray for her until this trial has come to its end! Pray that God would grant her strength in her inner person, as Christ dwells in her heart by faith, in His immeasurable love and that she would be filled with all the fullness of God. Pray that God would open a door for her to testify of the Lord Jesus. Pray that the same love which fuels her resolve for Christ, would form in yourself and the Christians within your fellowship. Leah is a fifteen year old Nigerian Christian girl kidnapped over a year and a half ago, along with 109 other Christian girls. She alone remains unreleased. She has remained in captivity because she will not deny her faith. 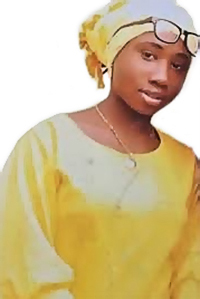 Last month in a video entitled “message in blood”, the Boko Haram terrorists tie up and shoot 25-year-old Saifura Husseini Ahmed, a midwife with the International Committee of the Red Cross. They declared that Leah and another nurse will die the same if their demands are not met by the Nigerian Government in one month. Leah’s month is up within the next few days and she needs you to remember her. Please pray for her. Pray that God will be powerfully and manifestly present with her to strengthen, comfort, and empower her with Christ’s love. Pray that God will open the eyes of the blinded Muslim terrorists to God’s righteous judgment and His desire to forgive, even their most heinous crimes, through repentance and faith in Christ’s shed blood. Pray that regardless of the outcome, that Leah’s life will bring glory to God and challenge all of us to live for Christ, as Leah, which is best described in Revelation 12:11. 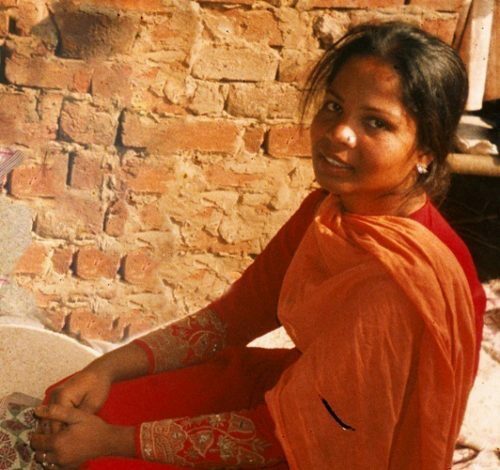 This entry was posted in Asia Bibi, Hebrews 13:1-3, Leah Sharibu, Let brotherly love continue, Revelation 12:11, suffering saints, the persecuted church, Uncategorized. Bookmark the permalink.